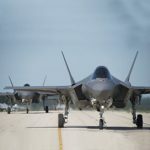 A first batch consisting of two F-35A Lightning II stealth fighters has landed Monday on Kadena Air Base, Okinawa to participate in a six-month operation part of U.S. Pacific Command’s Theater Security Package program, Stars and Stripes reported Tuesday. The arrival follows an announcement the U.S. Air Force made in October. Ten additional fighters from Utah’s 34th Fighter Squadron are expected to follow the first two. Japanese Defense Minister Itsunori Onodera said to reporters that the deployment is a sign of U.S. commitment to protect the region from emerging threats including the conflict with North Korea. Onodera added that he requested the Air Force to observe noise-control measures to minimize the F-35A’s impact on Okinawa residents. The effort marks the F-35A’s first assignment under the PACOM.